Moscow has overtaken Tokyo to become the most expensive city in the world, according to a new study. According to Mercer Human Resource Consulting's annual report, an expat's money stretches three times further in Asuncion, Paraguay - the cheapest city. Mercer said it ranked 144 cities on transport, food, clothing, household goods and entertainment costs. 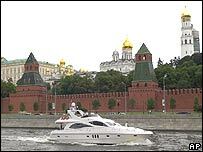 After Moscow the world's next most expensive cities are Seoul, Tokyo, Hong Kong and London. The main cause of Moscow's ascent was a surge in property values, Mercer said in its annual report. "Steep accommodation costs have contributed to Moscow's high ranking, as the recent property boom has driven up rental prices for expatriates," Mercer said in its report. Rising prices are also a problem in Russia, where high oil prices helped drive the inflation rate to 5% during the first three months of 2006. The International Monetary Fund has warned that Russia now has little chance of meeting its 2006 inflation target of between 8.5% and 9%. "We have seen significant shifts in the cost-of-living rankings over the past few years, reflecting a changing global market," Mercer explained. Over the past 12 months, London has dropped two places in the rankings, mainly as a result of a decline in the value of the UK pound against the US dollar. Currency movements have also seen Ukraine move up from 54th to 21st as its hryvnia strengthened against the dollar. Mercer said its report was often used by companies that sent their workers abroad as foreign, or expatriate, workers.